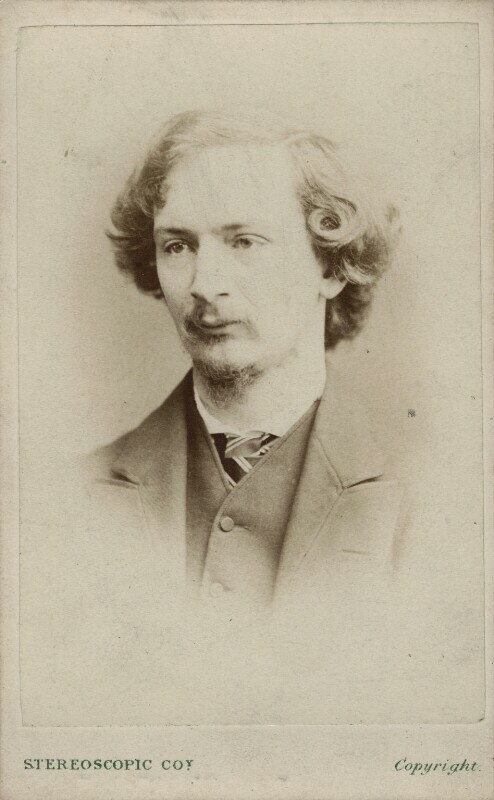 Algernon Charles Swinburne (1837-1909), Poet and literary reviewer. Sitter in 25 portraits. Elizabeth Garrett Anderson is the first female to be awarded a doctor's licence. She is also involved in collecting signatures for the Manchester Suffrage Committee, the first suffrage organisation, formed this year. John Stuart Mill was also elected to parliament this year on the platform of women's suffrage. Palmerston dies in October, and is replaced as leader of the Liberal government by his Foreign Secretary, Lord Russell. Lewis Carroll's Alice in Wonderland is published, inspired by Carroll's relationship (as Oxford don Sir Charles Dodgson) with his friend Henry George Liddell's daughter Alice. Matthew Arnold publishes the first series of Essays in Criticism, a defining text in the development of English literature as an academic discipline. In the American civil war, Robert E. Lee surrenders the Confederate Army of Northern Virginia to Ulysses S. Grant, leading to the surrender of the Confederacy's remaining field armies. A few days later, US President Abraham Lincoln is shot dead by Confederate sympathiser John Wilkes Booth. Later this year slavery is officially abolished after years of fierce campaigning. In response, the first branch of the Ku Klux Klan is founded on Christmas Eve.